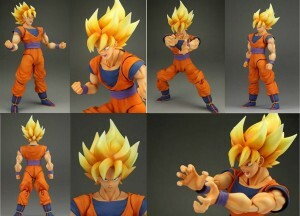 The most in demand Dragon Ball Z toy the S.H.Figuarts Super Saiyan Goku is going to be coming back for a limited time in March 2013. Since the SHF Super Saiyan sold out the first time it has had one reissue which was a USA contention exclusive and since then has fetched prices of up to $500. With the history of this figures releases it’s going to be one which should be pre ordered as there will be a very high demand for this figure. The reason of the re release is probably the new movie Dragon Ball Z 2013 which brings Akira Toriyama into the anime production side of the franchise for the first time.